25 years ago, Frank and Dolores Kiernan saw their world fall apart when they were both made redundant. With their future looking bleak, they embarked on a journey to form their own business. And in 1989, Kiernan Structural Steel was created. Today, ready to mark their 25th year anniversary, they have much to celebrate. From what started out as a way to create jobs for themselves has now grown into a hugely successful business that employ over 100 people and an annual turnover of €13m in 2012. 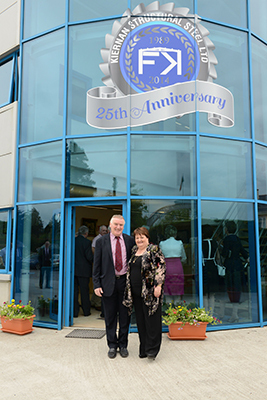 Even after 25 years, they have not lost any of their enthusiasm for the business or industry. Inside their modern factory large CNC operated machines cut and drill the raw material into their required lengths in a largely automated process assisted by the STRUMIS software nesting and production routing features to further assist in managing purchasing and stock control hence reducing overheads and waste material. "Our staff are highly skilled, many have been working with us for up to 20 years," says Frank. "While we are a family-owned and family-run company, everyone has a real say in how the company is run," he insists. The story of Kiernan Structural Steel is a real example of how one couple managed to turn what could have been a bleak future into a hugely successful steel fabrication business through hard work and investment in the right technology enabling ROI.